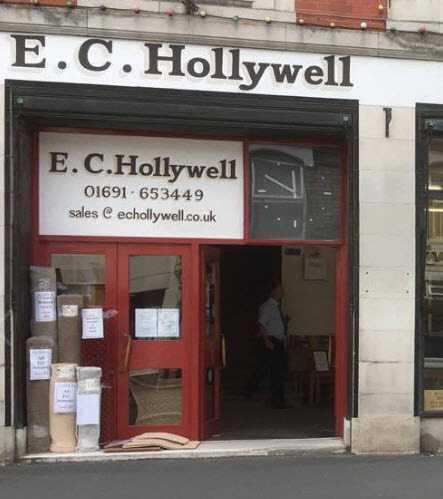 For 60 years, the EC Hollywell shop has graced the streets of Oswestry and taken pleasure in serving the locality and indeed further afield. As Oswestry’s leading Carpet and furniture store, we currently have over 20,000 square feet of interiors and carpets to browse. We have an experienced and dedicated team of salesmen, warehouse management, delivery drivers and carpet fitters. Ted and his wife Pat are still very much active members of the team and Ted still enjoys being front of house, serving customers and spreading his knowledge of the store and local area. The last few years have also seen the growth of the family within the business with a further 2 granddaughters joining the team. We now Open 6 full days a week. The last 3 decades have seen a dramatic change, not only in the development of the business but also within the store. As a traditional business we were in keeping of the times and kept the shop closed on a Thursday afternoon, much like the rest of Oswestry. Perhaps the biggest change in this time would be reflected in the role changes within the store. Ted and Pats Eldest and youngest children Amanda and Brett have played a key role within the development of the business. Brett moved into the role as Managing Director and Amanda as company secretary. In 1957 in a small shed at a rent of a pound a week with an ex covent garden hand cart (which still sits pride of place in the shop to this day!) Ted Hollywell would push the cart across town, collect a suite and push it back to his shed – reupholster it and return it as new. Ted was eventually offered a shop in Beatrice street to rent and here he expanded his business to incorporate selling new furniture and fitting carpets- he spent approximately 30 years on these premises before purchasing and expanding further just a few doors down the street to the current shop – a purpose built co-op building which coincidently had been built the same year Ted Hollywell was born. We pride ourselves on being one of the few furniture and carpet shops expanding year on year!